Eagles’ quarterback Carson Wentz may be out of the playoffs with an injury, but that didn’t stop the PETAphiles on Twitter from attacking Wentz for posting a photo in support of bird hunting. The NFL standout tweeted a happy birthday message to his hunting dog, Mama Henly, along with a picture of the dog standing over approximately 20 dead Canada geese. That, of course, was enough to bring Wentz’s anti-hunting fans out of the woodwork. The quarterback chose the most reasonable of his critics and replied with tact and conviction. While Steve Beef (ironic name, no?) kept his reply respectful, others failed to show the same restraint. George Altemeyer has clearly never been hunting, and also doesn’t seem to be familiar with meat freezers. Mary Jo Tegethoff, knowing Wentz’s penchant for quoting the Bible, tried a different tack. Unlike Wentz, however, she both misquoted and misinterpreted the Sixth Commandment (Exodus 20:13). And Joseph Catalano even suggested that Wentz’s injury was the result of bad karma. 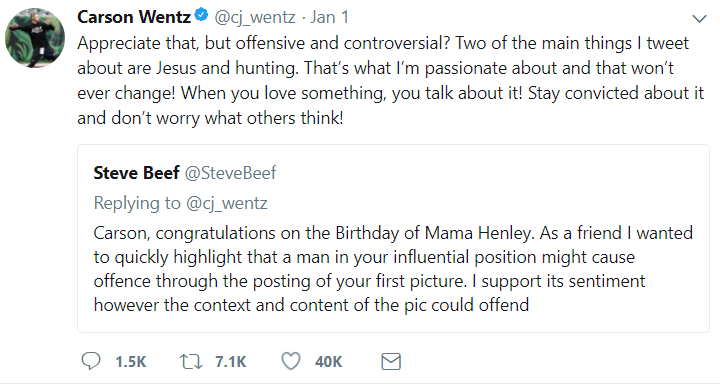 The majority of replies to Wentz’s original tweet were positive, many of which included pictures of hunting dogs or successful hunts. But his smattering of critics are good for a laugh, and you can find more of them here. Wentz is indeed an avid hunter, and he and his brother have posted a number of their exploits on their hunting channel, Wentz Bros Outdoors. Hey Bubba Great photo, beautiful dog and geese! A good retriever is hard to find. Celebrate your four-legged friend. Actually, the bible said, “Thou shall not murder.” Killing is allowed and sometimes commanded. The problem with Bible study classes is that they don’t need to read and reread what they should know. They should try to understand that not all translations are correct and that not everybody believes in that Bible. Most people know that they would have to kill somebody trying to harm them or their family. The Bible is based on the Old Testament, which we see mistranslated into English, from a Greek translation. Sometimes, they get it wrong, but the world does not care that there are more moral lessons to be learned there. It would be a sin to waste any life, including geese if you did not intend to eat them. I must worry about the critics. They have the notion that they can shame people into doing what they want because they insist they are morally correct. But, they simply do not have enough sense to realize that food is not manufactured in a factory. but the text does not suggest the subject is human. It could also very well be speaking of animals. Murder according to Gods Holy Word is the taking of life needlessly and clearly humans have been do that for centuries. Of course what was given to at Mt Sinai was ONLY foe the Jewish people so unless Wentz is Jewish (like me) he was never commanded “do not murder” in the first place. These morons take their politics straight from Uncle Joe Stalin.. No individual freedom, force their policies on everyone and denounce anyone who disagrees. Do they understand that the basic freedoms this country was founded on and the first 10 Amendments, The Bill of Rights, that protect those freedoms. Hunting has been around as long as mankind. During Stalin’s reign millions starved, many could have hunted, but in a Totalitarian government the “The People” are not free to own guns. I don’t understand why so many of the comments sound like the writer isn’t offended but they are worried others might be. I also don’t understand why so many people insist on posting their whole life on the internet and why so many people feel the need to troll the people who are not like minded and make dumb comments about their choices. Facebook, Twitter and all the other BS are the downfall of society. Way to go Carson! Great hunt! Must have been a great time! I’m from Texas and a Cowboys fan. You can come hunting with me anytime. I use to hate any players from the eagles are people from Philadelphia. I’ve can’t dislike you because you’re a class act on and off the field, unlike the classless players who are kneeling during the anthem! Now that I know you hunt, that’s even better. Parked Wars showed me there some great people in Philadelphia too. Don’t let the liberal punks get you down. With the” take a knee” protest going on about the only fans left watching the NFL are the far left democrats. There are far fewer normal people still paying attention to support Wentz. Wentz is left suffering attacks of hypocritical indigence of the take a knee supporters. I’d advise them to kiss both his and the dogs bottom if I were him. I’m surprised anybody on the far left watches football. I’d expect the “barbarism” & “violence” of it to offend them. All these snowflakes that have a problem with Wentz’s picture need to go to a meat packing or chicken processing operation and follow the process from the killing end to the finished package that you buy in your local supermarket. At least those geese had a chance. The original Bible Old Testament text translated from Hebrew. It did not say “Thou Shalt not kill” It said “Thou shalt not murder”! There are plenty of wars with men killing men in the Old Testament and God supporting the Jewish people. Amen, you are exactly correct in your discerning of the scriptures and in your Hebrew. Social media is going to be the death of our society. Even the creators of it say as much. You put yourself out there and people are going to a take a “shot” at you. By the way, you any kin to Michael Vick? Mmm, Mmm. Tasty Christmas goose was one of my favorites growing up. Mom really knew how to prepare them. And for those folk who are really stupid they make these machines called freezers to store food for later. Antis are so unbelievably stupid it boggles my mind! I don’t sit down and eat a whole deer in one sitting! So of course he will not sit and eat all 20 geese! Also there were probably several other hunters with him! The dog most likely worked for all in the party, so they got a photo with all of the birds. Why don’t you liberal idiots think something through before you run your mouth about something you know nothing about!!!! THINK IT THROUGH, BEFORE YOU SPEW! If they thought anything through then they could no longer qualify as LIBERAL IDIOTS now could they ? Wish folks would stop tweeting nonsense. Who has such zero life that they pay attention to twitter nonsense?? Are you antis out of your minds. The comments you have left are beyond childish. You jump up and down sniveling about a bunch of dead tasty geese but where are you about the dead kids in Chicago???? Il bet every one of you snivelers are the first ones to run to Safeway or the corner meat shop and order a big T-bone and think noting of where it came from. I ran a meat shot for years and hunted all my life and on far too many occasions I had to explain to some dumb anti where their steak came from but most of the time they were too stupid to understand. So much butthurt in the world today. What ever happened to Live and Let Live? This is insanity! The antis are plain lunatics, but tweeting ‘happy b-day’ to your dog is also a bit silly. One of the basic problems in this country is that nobody minds his own business – and social media by its nature attacks the notion of privacy. If I don’t know you, I don’t care about your dogs b-day! If I don’t know you I don’t care if you hunt, how many geese you shot or even if you are against hunting. In short, a guy goes goose-hunting with his dog and it’s a big-deal, one way or the other, to people who have nothing to do with it! That is nuts! Death to social media? Okay… without it, you could not have left your comment for the whole world to see.